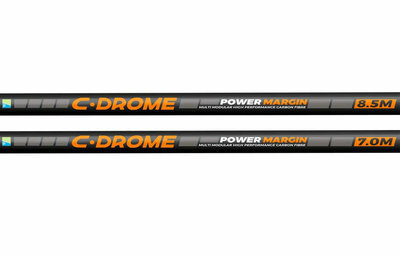 Constructed from incredibly strong multi-modular carbon fibre, the C·Drome Power Margin pole is available in both 7.0m and 8.5m, and is pre bushed with the specially designed C·Drome PTFE bush, allowing you to fish with up to a 4.0mm Hollo Elastic. The two poles are built to withstand the largest of carp and serious bagging sessions where big weights of big fish are to be expected. The poles are super strong without compromising on weight and rigidity, making them suitable to fish with at full length all day. Each pole is supplied with one spare pre bushed kit and a pole bag.